I’m a pretty big fan of Wizardry and its clones. Generally if there is a first person dungeon crawl to be had, I probably own it and have played it. 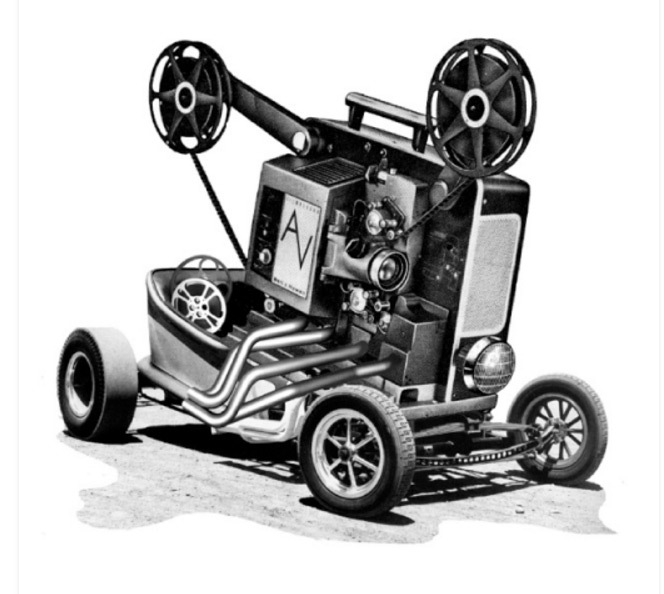 I’m not the only one of staff with a deep love of Sir-Tech’s venerable creation. Mark, Sean, Joel, Kennedy and pretty much everyone on staff either loves Wizardry or one of its clones like The Dark Spire, Elminage Original, Class of Heroes or Etrian Odyssey. Although the genre has become more or less something you play on a handheld system, veterans of the genre like myself can’t help but wish there were more Wizardry clones for the PC. 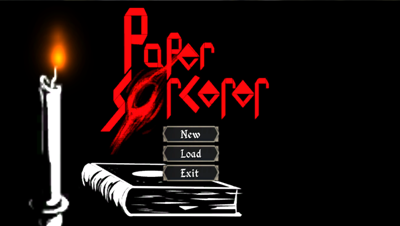 Well, enter Paper Sorcerer – a game by fledging development studio Ultra Runaway Games. I, along with 1,190 other Kickstarter backers (including another DHGF staffer) backed this crowdfunded effort, and why not? It was only three dollars to get a copy of the game!THREE DOLLARS. Of course if you buy it now, it’s a whopping five. The game raised almost triple its original goal. Of course extra funding means stretch goals which in turn means a long dev time. Paper Sorcerer, originally scheduled for release in August of 2012, ended up coming out fourteen months later. The bad news is that the game is still pretty buggy, but since release a second build has been released and by the time this review goes live, a third will probably have been put out as well. The good news is that for three dollars and as a first time effort by a company, Paper Sorcerer is incredible and it’s easily one of my ten favorite games of the year. The plot and gameplay of Paper Sorcerer is very reminiscent of Wizardry IV: The Return of Werdna – a game almost universally cited as the hardest video game ever made. While Paper Sorcerer is nowhere as challenging (like including a max number of key strokes to complete the game), it is a pretty tough game where you’ll die regularly unless you save often and grind your characters up. If you’ve ever played a first person dungeon crawl, you pretty much know what to expect in this regard. Like Wizardry IV, you’re actually playing as a one-time end boss in this game. Your sorcerer, male or female once terrorized a kingdom before being brought down low by a group of intrepid adventurers. Forced into a book like mystical artifact known as the Librum Claustrum. You find yourself imprisoned in the book which acts as an inter-dimensional jail for a lot of would be tyrants. However unlike the majority of evildoers who are in a catatonic state within the book, you manage to free yourself from your cell and slowly but surely, gain some of your power back. As you traverse the first floor of the dungeon you’ll be able to resummon some of your old allies (up to a party of four including yourself) and you’ll also discover that there is a thriving city of sorts within the book and a definite way to escape if you have to power and courage to do so. Each level of the book is made up of four levels with a boss fight at the end. Kill the boss and you destroy part of the binding holding the book together. Destroy them all and…well, who knows? You need to be very careful with the characters you summon as you can only have a maximum of three out at a time and aside from the small gaps between the first three that you choose, it’s a long time before you get any others. Those first three summoned creature and the balance between them will determine how well you thrive in Paper Sorcerer. You have everything from a werewolf who acts as a D&D style monk (no armor or weapons, but very fast) to a Witch (buffs and debuffs). A Vampire can heal you, but only by shedding his only Hit Points. In return, he can do damage to enemies to gain those lost Hit Points back. I’ve personally found that the best character for a first summons is the Cultist. He’s basically a Cleric/Priest as he can heal right away which is great since your main character has so little hit points and next to no damage at the beginning of the game, but he can also equip heavy armor and do a lot of physical damage. I can’t overestimate the importance of healing in this game, especially as since the first build of the game has a bug where if a character is killed but brought back to life, they can’t take part in further combat, leaving you a man down. 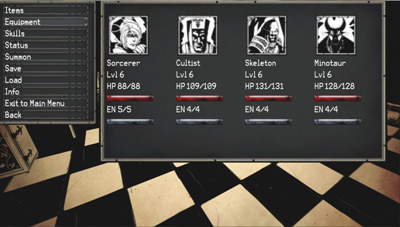 I’ve found my best team to be the Sorcerer, the Cultist (good all around character with healing magic), the Skeleton (warrior that can use the best weapons and armour, while also having the highest defense in the game, so he can be a wall for you) and the Minotaur (only light armor, but tons of hit points and does an insane amount of damage). Basically my strategy has been to have the Minotaur and Skeleton do tons of damage, have the Cultist continually heal those two off and then pick away with my Sorcerer’s powers. The one two hit of Poison and Fire is pretty nasty. So far I’ve gotten through multiple levels of the game and I’ve yet to lose a single character. Then again, I’ve been playing these games since a tiny tot and I’m one of the few to ever beat Wizardry IV so I know this genre crazy well. Don’t necessarily go with MY team though. If you want to field a goblin, an abomination and a troll, that’s all good. Just know that you’ll be stuck with that core team of four for a long time and if the balance is poor, you will die a crazy amount of times. Although the game is primarily about the exploring of dungeons and combat, the story that is in Paper Sorcerer is very nicely done with NPCs having distinct and entertaining personalities. There is always an attempt to give you some sort of narrative about where you are, what you are doing and who your enemies are. The game is a lot of fun in this respect and I really grew to care about certain NPCs and even my silent summoned allies. The visuals in Paper Sorcerer are simply fantastic. I absolutely adore the art style. It’s like a fantasy Sin City in terms of character design and backgrounds. I was impressed how much detail when into the character designs and their attacks, but I also really loved the look and feel of the various dungeons. There’s not a lot of animation to the game, but that’s true of all Wizardry clones. That said I was happy to see animated attacks and the ability to see subtle changes in the environment from time to time. You have to realize all the art in this game started out as pen and paper drawings. There isn’t any cell shading. It’s all hand drawn high resolution visuals, which makes the game all the more impressive graphically. The art style is just so fantastic that I am always thrilled to find a new enemy, NPC or background in this game. It’s proof that you don’t need a multi-million dollar budget for graphics or images that tax a current system to have some really nice visuals. The soundtrack, if you can believe it, is even better than the graphics. I am kicking myself for not pledging at a higher level to get a copy of the soundtrack or even a boxed physical version of the game. My wife really enjoyed listening to the game while she was doing her own thing and I honestly couldn’t get enough of the various tracks. Each time I heard a new song, I’d sit there and just listen for a while. Thankfully this is a turn based game without any real time elements so I could do that. The music just really helps bring Paper Sorcerer to life and it’s one of the best video game soundtracks of 2013. The sound effects are fun, but there’s not a lot of variety to them, mainly because you have the same four characters for most of the game and thus you’ll only hear a limited amount of the effects in the game. If you just start a ton of new games and try out different summons, you’ll hear a larger variety than you would from just playing the game. Still, the audio aspects of Paper Sorcerer are just awesome and for five dollars, you can get your money’s worth from just listening to the game. Playing Paper Sorcerer is pretty simple. You use the WASD or arrow keys to move and the mouse to look around or to interact with objects. 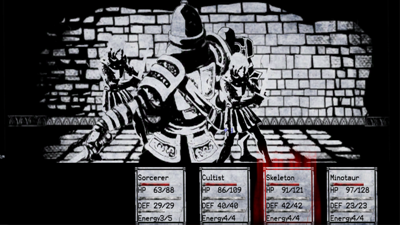 Most of the game has set battles where the enemy is represented by dark clouds. Run into the cloud to initiate combat. You can ignore most of these, but if you don’t battles you don’t level up or gets their gems and assorted other loot. More importantly, you’ll be underpowered for boss fights. Now there are random battles in the optional catacombs dungeon, but the amount of battles aren’t too bad and it’s a great place to level up in if you find your current dungeon level to be too hard for your team at their current strength. Battles are done like a turn based RPG. You pick each of your characters’ actions from a menu. You can do an attack, use an item, defend or use one of your special moves. Special moves use energy points. You start with four energy points but can gain more by leveling up or customizing your character. Special attacks use between one and four energy points but your character regenerates them at a rate of one per round. So it’s not as if you only get four energy points per dungeon level or until you rest. 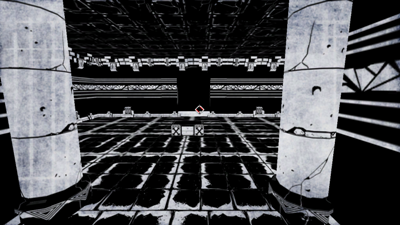 Characters and antagonists attack in order of agility and you just repeat until one side wins; hopefully yours. It’s worth nothing that you have a defense stat in addition to hit points. Defense will be depleted before hit points to simulate your amour taking the brunt of the blows first, so if you have a character with high hit points and a heavy defense rating (see: Skeleton) you have a meat shield that take just about anything and still stand. After you complete the first four levels and beat the boss, you’ll have access to Sanctuary, where you can access a store, sleep (thus recharging your health and energy), enter the catacombs, talk to other denizens of the book and even customize your characters. 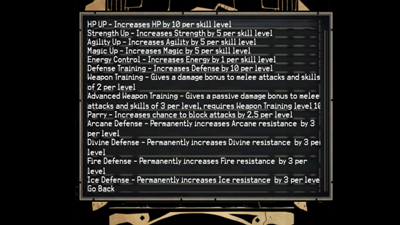 Here you can up resistance to types of magic, get more hit points, increase your maximum energy level, raise statistics and more. It’s expensive, but well worth it because if you have trouble getting through the game, you can always grind on lower levels, collect gems and then buy a bunch of stat boosts to help you make it through. As you can tell, it’s pretty easy to learn the tricks and trades of the game, but it takes a long time to figure out the best possible team combos and how to best do combat. Now as fun as the game is, I can’t deny it’s a bit buggy. Resurrection items, which bring a felled character back to life do just that, but they can’t do anything in combat. This is a bug that has been removed from the first build, but it’s still worth noting. Other bugs include things not loading properly if you load a saved game from inside a game. Enemies might not be generated correctly. One example is that I got a wall of text from the boss, but he never actually showed up, so I just walked to the exit. Clouds of enemies may not generate or they might but not be able to be triggered. As such, it’s best to close all the way out and load from there to prevent these bugs. I should also point out that you should never save your game in a hidden room or something that must be unlocked. If you shut down and start back up, you’ll find yourself locked in with no way out. All doors, traps, and secrets reset each time you load a game, so that means the wall you opened earlier will now be shut up and your save is pooched. The game also has problems loading your character equipment screens sometimes and you’ll have to tap Q or E to run through the screens to make them generate fully. So on and so forth. The bugs are minor and annoying, but they are all things be worked on as I review this, so I have no doubt they will eventually be smoothed out in time. The raising from the dead and not being able to use your character is the big one and that’s why I strongly urge you to save constantly so you don’t have to restart and lose a lot of progress because you couldn’t keep someone alive. Until this bug if officially fixed, healers and defensive warriors are a must have. I’m extra lucky none of my current team has died, but even if they did, at least I save enough that I’d only lose a few seconds or minutes of progress. In terms of replay value, well the game is pretty linear. The only thing that will change in each playthrough are random item drops and what characters you choose to have on your team. As such, there isn’t a lot of reason to go back to Paper Sorcerer one you beat it unless you really love the experience, but at least the game will last you a long time as you try to make your team powerful enough to escape the book. Balance wise the game has four difficulty settings: Easy, Normal, Hard and 1980s. I would suggest Easy if you’ve never played a Wizardry clone before. It’s about on par with Etrian Odyssey in terms of difficulty. Which each level in difficulty, you’ll do less damage and take more, while the opposite is true for your opponents. 1980s is insanely grueling and will tax even the best Wizardry fan, but it’s nice that the game is made to be inviting enough to gamers of all skill levels. 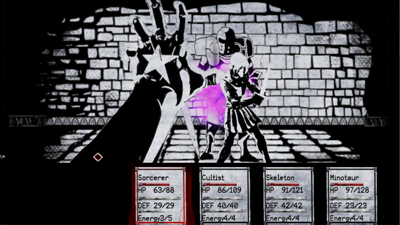 In terms of originality, Paper Sorcerer follows all the usual tropes of a Wizardry clone. However it also does a lot of things different like the unique art style and soundtrack. Your party is only four characters deep compared to most Wizardry clones maxing out as six. You’re playing the major end boss level evil of a world instead of the heroes. There is no alignment since you and all of your party are EEEEEVIL (Indeed!). The characters are very different in name value and character model, but they do still have the basic class trappings. The Cultist is a Cleric. The Werewolf is a Monk. The Skeleton is a Warrior. The Minotaur is a Barbarian. So on and so forth. Still. It’s nice to see the effort to make Paper Sorcerer stand out from most Wizardry Clones even if most of the differences are minor and superficial. Those differences add up and make this game superior to most of the Wizardry clones that have been imported from Japan over the past few years for the PSP and 3DS. As you can imagine, I had a hard time putting Paper Sorcerer down. Whether it was starting a new game to try out new team combinations or watching my fore group of Skeleton, Minotaur and Cultist help the Sorcerer mow down a cross section of whiny do-gooders, Paper Sorcerer is the first person dungeon crawl I’ve been waiting for since companies like Sir-Tech and SSI went away. It’s a wonderful game and each build will just make the game that much better. 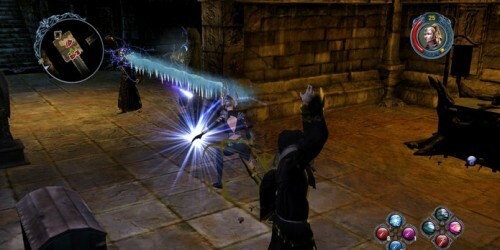 Even better, with a price tag of only five dollars, the low cost of the game makes it especially inviting to people who have never played a Wizardry clone before and the multiple difficulty levels mean that even newcomers can get a hand on the game’s style and perhaps even progress through a few dungeon levels before really mastering the mechanics. I mean, even if you don’t like the gameplay, for five dollars you’ll still get your money’s worth from the story, graphics and soundtrack. Even if the game doesn’t get patched beyond the resurrection bug, the overall experience is still one well worth experiencing and I can’t recommend it enough. The fact the game has less bugs and plays better than a lot of sixty dollar big budget releases says something about the quality of the game. It also says that you should stop reading this review and buy Paper Sorcerer already. 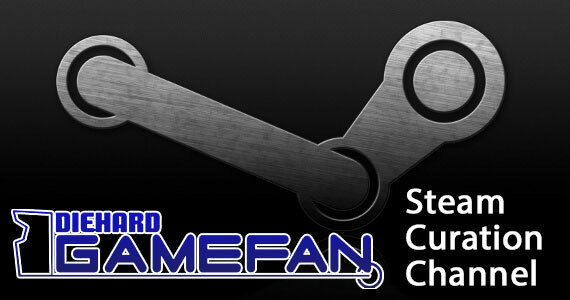 Come on people, it’s only FIVE BUCKS and it’s one of the best overall gaming experiences I’ve had in 2013. Pick this up; you won’t regret it. Paper Sorcerer is still a bit rough around the edges with bugs and glitches that are being cleaned up, but it’s a five dollar Wizardry clone that still looks, sound and plays better than a lot of big budget releases from this year. The game’s plot takes a page from Wizardry IV, although it’s thankfully nowhere as difficult and it’s fun to be the bad guy for a change. Take heed though, as the party you choose at the beginning of the game is the bulk of your team for much of the game, so choose wisely. I can’t empathize enough how impressed I am by Paper Sorcerer and how much fun it is to play. With a price tag of only FIVE DOLLARS, there’s no excuse not to download this and experience it for yourself. This content has been plagiarized. He also cites GameFAQs. He has plagiarized the content across multiple outlets.